Open since 1986, we offer a wide range of cleaning and waxing services to enhance your vehicle and protect your investment. At Sir Waxer our goal is to provide the best service at a reasonable and competitive rate. Sir Waxer is an appointment business that accepts drive up business when possible. 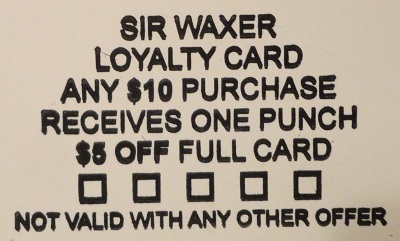 Get the Sir Waxer Loyalty Card! Any $10 Purchase receives 1 punch.